1826s 'Thin Blue Line' [Police] mono/blue Union Jack patch. 40 x 55mm. 'The Thin Blue Line' [police] Mono/Blue Union Jack flag patch. 40 x 55mm. Velcro backed. ..
1831l Poppy/Union Jack flag patch, Olive. 50 x 80mm. Poppy / Union Jack poppy rememberance patch, olive. 50 x 80mm. ..
1831s Poppy/ Union Jack patch, Olive. 40 x 55mm. Poppy / Union Jack velcro backed flag patch. 40 x 55mm. ..
1832l Poppy/Union Jack flag patch Mono [police]. 50 x 80mm. Poppy / Union Jack flag patch, Mono [police]. 50 x 80mm. Velcro backed. ..
1832s Poppy/Union Jack flag patch, Mono [police]. 40 x 55mm. Poppy / Union Jack Mono [police] flag patch. 40 x 55mm. Velcro backed. ..
1838a Australia Flag Patch, Auscam. Australia national flag patch. Auscam. Velcro backed. ..
1838d Australia flag patch, Desert. Australia flag patch, desert. Velcro backed. ..
1838des New Zealand Flag patch, Desert. New Zealand flag patch, desert. Velcro backed. ..
1839dpm New Zealand flag patch, DPM. New Zealand flag patch. DPM. Velcro backed. ..
1840c U.S.A. stars & stripes flag patch. United States, stars & stripes full colour flag patch. ..
1842 Irish Defence Force, unit ID morale patch. Irish Defence Forces, generic armed forces ID/Morale patch. Velcro backed. ..
1843 Irish Army, Ranger Wing, unit ID/Morale patch. Irish Defence Forces, Ranger Wing Unit ID/Morale patch. Velcro backed. ..
1850[L] Afghan National Flag [liason personnel] Large. Afghan National Army / UK liason Personnel flag patch, large size [1st version]. Velcro backed. ..
1850[s] Afghan/UK liason personnel flag patch, small size. 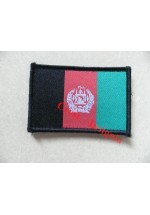 Afghan National Army / UK Forces liason personnel flag patch, small size, [2nd pattern]. Velcro bac..